X-Large - $26.99 Only 9 left! 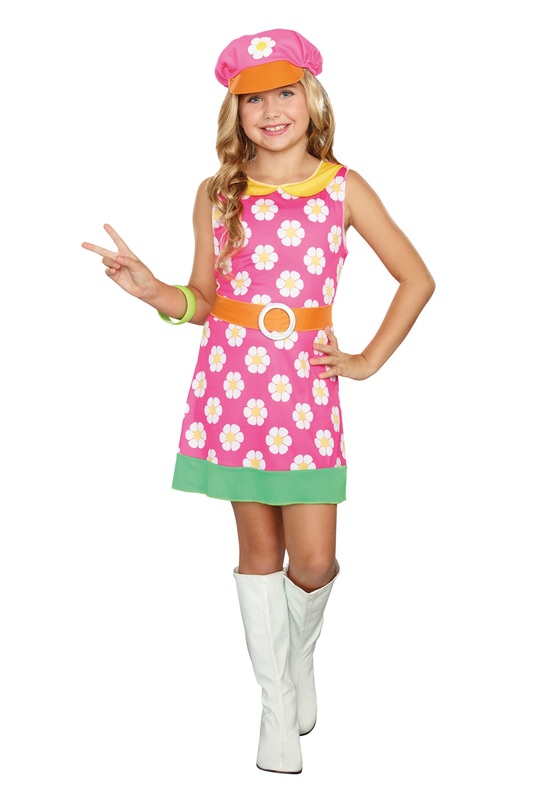 If your girl is looking for a blast from the past—the swinging 60s and the psychedelic 70s, specifically—this costume will deliver all the flower power she needs and more. Here's the gameplan: Help her grab all of your old Sonny & Cher and Beatles records, pick out some white go-go boots, provide her with the oldest (preferably perfect circle) shades you still for some reason own, and you both will be set to boogie in the appropriate style to the era's tunes. Or maybe use this unique look to complete your family's 70s theme and you'll be the coolest group of hippies around. Who knows, maybe an impromptu karaoke session during the themed night will lead to a multi-platinum-selling disco record and worldwide fame. But from personal experience, we can recommend against setting your expectations so high. After all, you want this groovy experience for your peaceful little girl to be a positive one. Records and all that are just extra effort, and you would have to get a business manager and argue over song lyrics. That sounds like the antithesis of family bonding, man. With the whole family or not, as long as she's wearing this costume's daisy-printed fabric and a matching floppy cap, everyone will take one look at her and know that her main objective is to spread peace and love! Who could resist admiring that?